You’ll love these thick and chunky Monster Cookies! 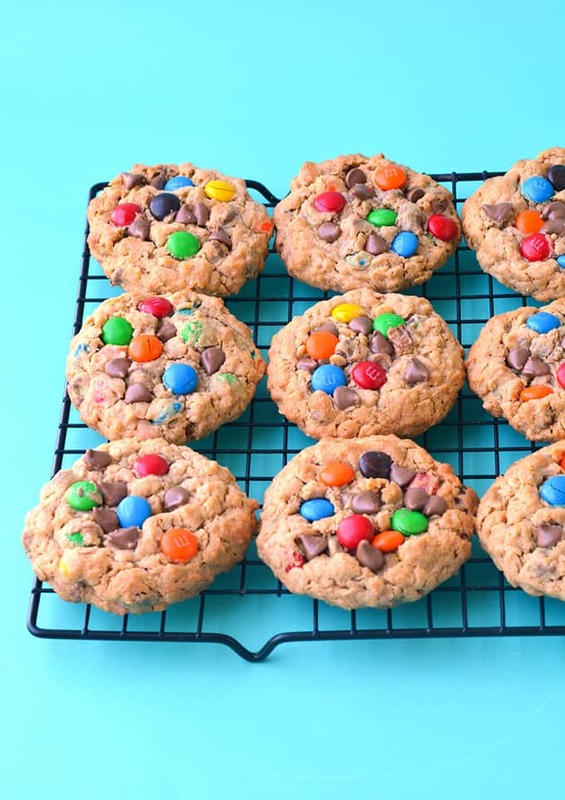 Made with a creamy peanut butter cookie dough, these Monster Cookies are packed with rolled oats, chocolate chips and M&M candy. I have a new weakness. Monster M&M Peanut Butter Cookies. 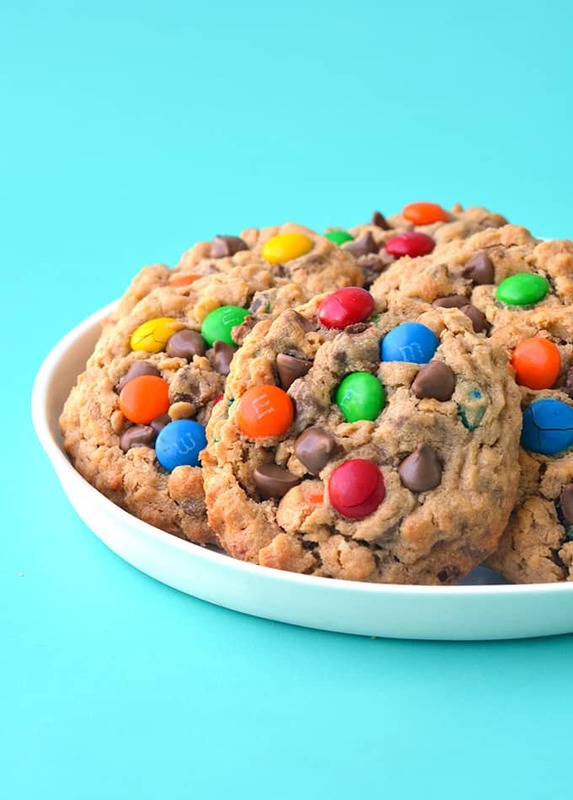 Have you had a Monster Cookie before? They’re lumpy, chewy and oh-so-irresistible. They aren’t so well known here in Australia, but let me tell you, they are an American delight. 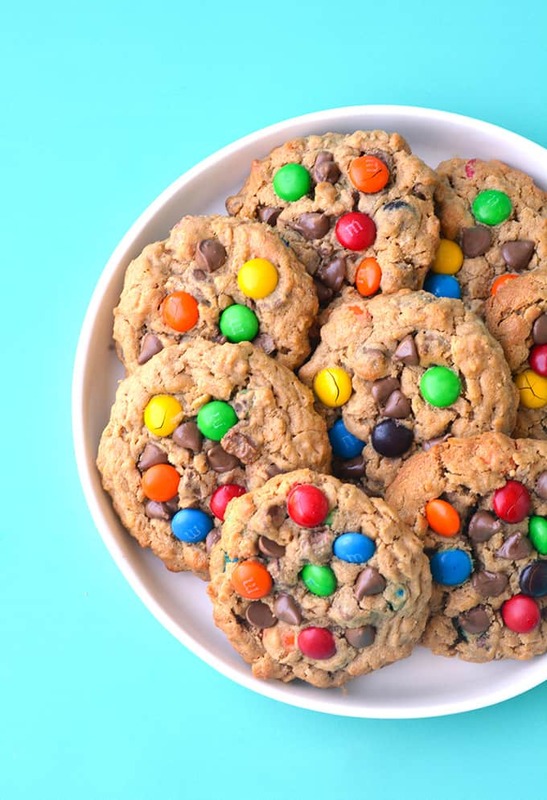 Filled with rolled oats, chocolate chips, M&M’s and peanut butter, there is SO much goodness in every single bite. The best part about these cookies is their ridiculously chewy texture from the rolled oats, and yet the creamy peanut butter makes the cookie dough just about melt-in-your mouth. Then there’s the burst of melted chocolate from the chocolate chips and the crunch of the M&M’s. There is so much going on and yet the flavours and textures blend perfectly. There’s only one rule – these Monster Cookies must be devoured with a cold glass of milk. I had to eat quite a few of these cookies, ya know, for recipe testing purposes, and I didn’t mind one bit. These cookies have a different make-up to regular cookies, with substantially less flour. And the rolled oats offer a truly chewy texture, similar to Oatmeal Chocolate Chip Cookies. One thing to note is that they will be very fragile when they come out of the oven so you need to let them cool completely. They will firm up and develop into a deliciously chewy cookie. It’s worth the wait – trust me. 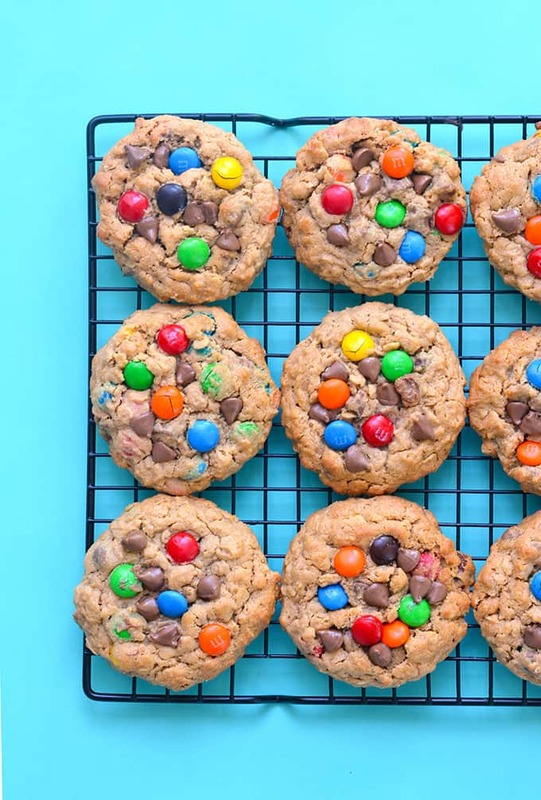 Monster M&M Peanut Butter Cookies filled with rolled oats, chocolate chips, M&M’s and peanut butter, there is so much goodness in every single bite. In a large mixing bowl, beat butter and sugar together with an electric mixture until creamy and pale. Add vanilla and egg and beat until smooth. Add peanut butter and beat until combined. In a separate bowl, whisk together the flour, baking soda, cornflour and oats. Add the dry ingredients to the wet ingredients and beat until combined. Add M&M’s and chocolate chips and mix briefly. Cover the bowl with plastic wrap and refrigerate for at LEAST one hour. Line two oven trays with baking paper. Preheat the oven to 180 C (360 F). Grab cookie dough from the fridge. The dough will still be a bit sticky but it should be firm enough to roll balls using your hands. Line the balls (approximately 1 heaped tablespoon) of cookie dough onto the prepared trays and then flatten slightly using your hand or a spatula, as they wont spread out as much as a normal cookie would. Press a few extra M&M’s and chocolate chips on top. Bake the cookies for approximately 12 minutes or until golden brown on the edges. Leave the cookies to cool slightly before gently moving to a wire rack to cool completely. This recipe was first published on Sweetest Menu in May 2015. Any chance you could use peanut m&m’s? Or would that throw off the recipe and/or taste? Hi Joel! Yes you can! They are a little bigger so sometimes they crack a little in the oven – but still delicious! I made 3 batches the other day. They are delicious but I’m curious how you get only 14 cookies when the instructions state to use about a tablespoon and a half per cookie. I followed the instructions but each batch yielded 24 cookies. Each baked cookie was approximately 3” across. Was that a typo and the recipe should state it yields 24 cookies or should I have used more than 1 1/2 TBLS of dough per cookie? Hi, is it okay to freeze the mixture?? Hi! Yes that should be fine. You can just thaw the dough slightly before baking or cook the frozen dough for a few minutes longer. Enjoy! I love monster cookies! They’re my favorite ever since I was a child. These look amazing! Thanks Natalie – aren’t they the best?! How large do you make the dough ball? What thickness do you flatten it to? Hi Pete, thanks for stopping by. This recipe makes about 15 cookies, so about a tablespoon of dough should be about right but it’s really up to you how big or small you would like your cookies to be. Just flatten the balls of dough so they are no longer round – again its really up to you how thin or thick you would like them. You can always bake one cookie and see how much it spreads out and then bake the rest. Hope that helps! These look amazing! Pinning right away. 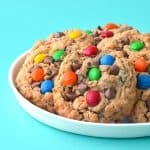 I’m American and have never had a monster cookie but I clearly need to get on them 🙂 Love the PB and m&ms combo! You’re right, I’ve never heard of these before and now that I have, just call me cookie monster!!! These wouldn’t last the day in my house. Definitely pinning for later. Monster cookies are easily a favorite of mine. It’s impossible not to like how thick and chewy they are! Love your version with the bright, colorful M&M’s! Tell me about it, I’ve been missing out ALL these years! Thanks Hayley! Yummmmmmm!!!! These have to be the best cookies EVER. 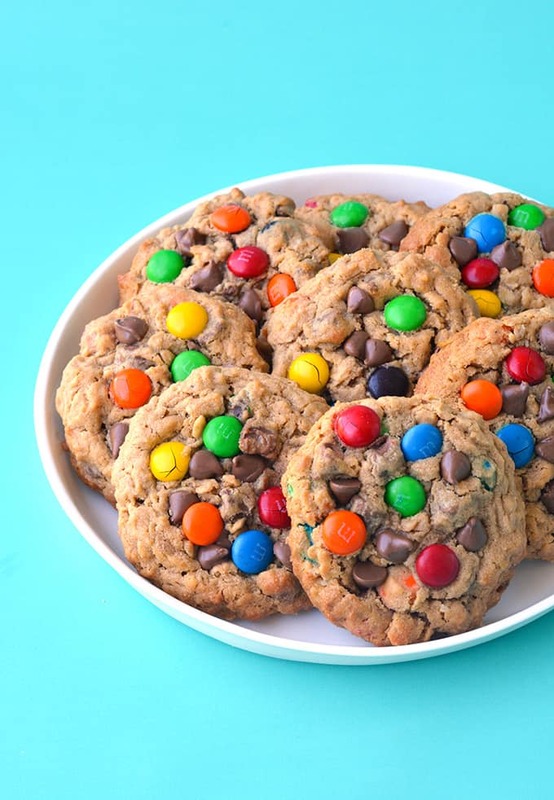 I love m&m’s and they are so perfect for cookies. What a perfect, beautiful treat! My mouth is seriously watering right now! 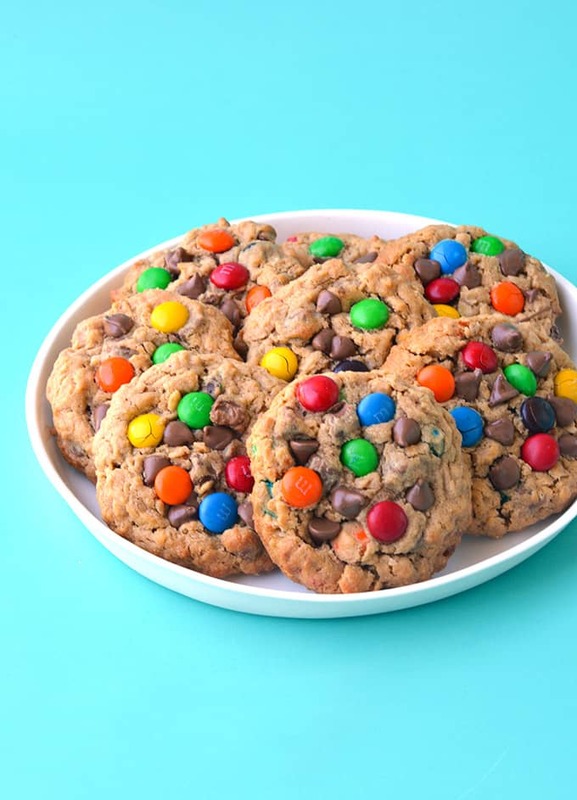 I totally agree with you on the monster cookies — easily one of the best cookies out there!! These look so delicious! Going to have to gluten-freeify these and give them a shot. YUM! These would totally be a weakness of mine, too!! They’re super pretty and I can tell they’re incredibly delicious! These cookies are amazing! Love how thick and chewy they are! Thanks Kelly! So thick and chewy! Yummy, yum! These look pretty and delicious! I love me a nice chewy cookie, especially if it has so many delicious flavors! Thanks Jessica! I love chewy cookies too! OH MY WORD! That’s all I can say here! Monster cookies! I think I’m enough of a cookie monster to handle a few of these with a glass of milk. Packed with all of my favourite things, and easy to make gluten free too! I cannot wait to get my hands full of these delights! Hahaha cookie monster indeed. You definitely should try making a GF version Amy! There’s not much flour in them to begin with and they are oh-so-delicious!